Sometimes getting kids to do the little things is the hardest, right? They manage to tackle difficult math problems, write amazing stories, and bust out STEM creations like it’s nobody’s business. But, neat writing and punctuation? Man, that’s hard! I wanted to share with you a few things that I use to help my kiddos work on these skills. When I taught Kindergarten I taught handwriting as I introduced and tuaght the alphabet. We continued to practice handwritng throughout the year in various ways. We used many different tools to practice forming the letters in many authentic ways. They are super simple, yet super effective! I don’t believe that children should write the same letter over and over a billion times on a page – we all know that they more they write, the messier it gets! I developed these handwriting pages to just have a few opportunities to practice. I usually have them circle their best attempt too. There are sentences on each page – they don’t necessarily have the focus letter, but are intended to practice all letters in a meaningful way. There is also a small box for an illustration – great way to check comprehension on the sentences :). This one is tricky, and takes a LOT of practice and reminders! 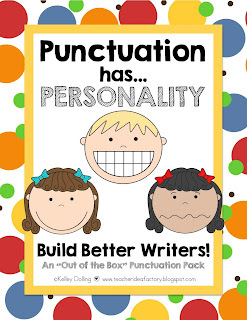 I really love to use Kelley Dolling’s Punctuation has Personality pack to reinforce the importance of punctuation. To continue to practice punctuation and sentence structure, we use scrambled sentences during our Daily 5 Work on Writing Time. 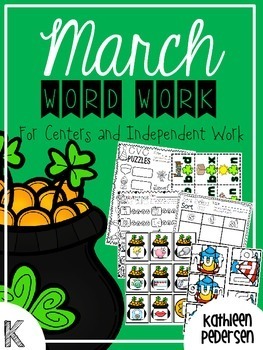 I currently have packets out through January – I hope to get February and March done ASAP! Another super fun way we practice handwriting and punctuation (other than during our Writers’ Workshop time, of course!!) it using Fix Its. Of course, we all know the best way to practice these skills IS through authentic writing, but sometimes kiddos just need that little bit of extra practice to even start noticing errors. I have used these fix it pages for years BOTH in Kindergarten and First Grade, and the children LOVE THEM! I created these WAY back in 2011 and have used them consistently ever since. A few years back, I gave these guys an update, so if you already own them, make sure you re-download! I hang this anchor chart in my room once we have introduced the fix-its. The children refer to it during Daily 5 and Writers’ Workshop as well. Since moving up to first grade, I have been absolutely horrible at taking pictures of the day to day action in my classroom! 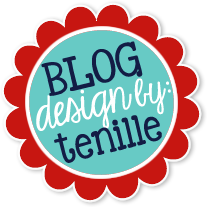 I know I have also neglected this old blog too. So sorry! 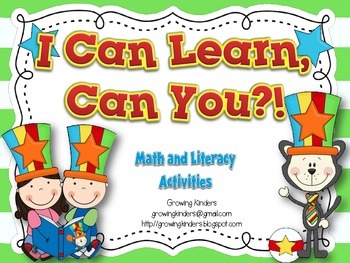 I wanted to share with you some of my favorite math and literacy centers from when I taught Kindergarten. Some of these could also be used for small group RTI (or MTSS as we now call it in our district). I structure my 1st grade math and literacy block much differently than when I taught Kindergarten and I will blog about that soon! 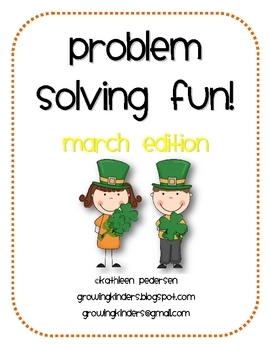 I’ve also used gems, coins, and my IWB for this activity. You can use whatever is easiest for you – this is a super simple center to put together. This was an activity that I had at my listening center. The children kept a listening center journal with just plain white paper. I would have a response prompt on a sticky label and they would write to that prompt. Easy and effective. Here is a super simple, directed drawing art project that we did. We drew with black crayons or oil pastels and then watercolored. 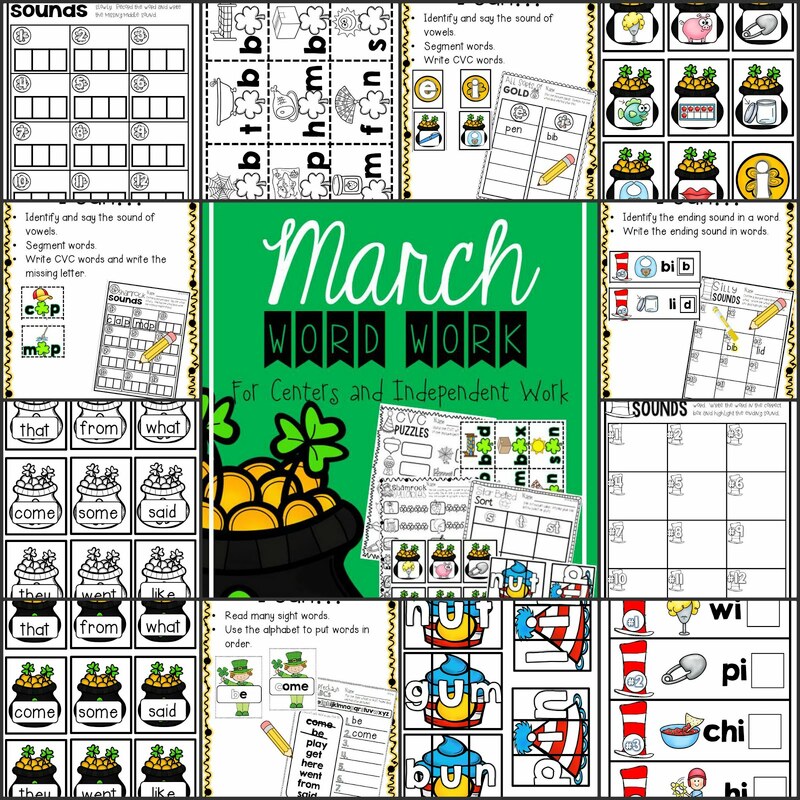 Some years we drew a little leprechaun to add to our pots of gold – I took a screen shot of my IWB page and you’ll get the gist of how that little green guy is drawn. 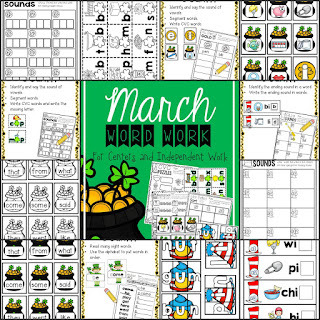 One project that I started working on while I taught Kindergarten were these monthly word work packs. 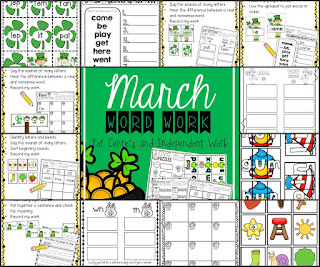 My children LOVED working on these fun, colorful activities, and they all corresponded perfectly to what we were learning. My ultimate goal is to finish these for each month, but man, life gets in the way! I have an almost 14 year old now, and a 9 year old and they sure are busy! We also celebrated Reading Month and Dr. Seuss’ birthday. We have done lots of fun activities, like wacky Wednesday, crazy sock day, green egg and ham day and so on! 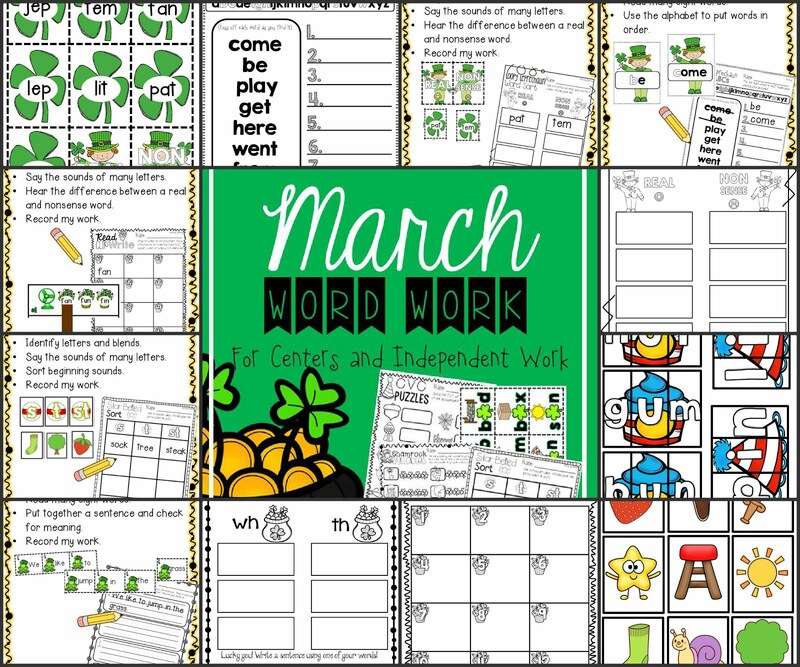 Here are a couple of other resources that I always used in March! I hope you have a great March! Can’t believe how this year has flown by!